Made with 100% all-natural scented lavender oil, this scented cat litter formula is ideal for cat owners who prefer their cat litter to be scented. No synthetic chemicals, clays or perfumes! Your home stays smelling nice, while keeping nasty odors and smells inside the litter box. 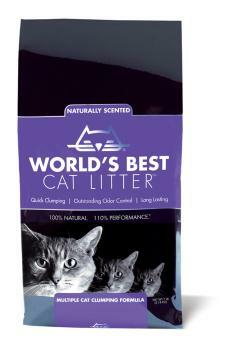 World's Best Formula contains an added all-natural plant derivative for enhanced odor control which makes it ideal for homes with two or more cats. This really is the world's best cat litter. Although it costs me a bit more per back it is saving me a fortune on how frequenlty I need top change it. If really keeps the odor down too!